A poem written for my future son, whenever he may come. The sun will rise right before your eyes, out of darkness comes light, day out of night. When darkness falls, know light will follow. Drink life in, when you feel hollow. These words are what i leave to you, wrote in my youth, with thoughts of you, just know that you are loved. Before your birth, for what it's worth, these words are ever true. You are safe, son, here in my arms. You will befall no harm as long as i hold breath. Come asteroids, falling stars, raging fires, or speeding cars i will gladly lose my life for you. For you are me, and i am you. When the day comes, you know it will, that I die, or I fall ill, Know that i am happy. Happy that you are a man, happy there's a greater plan, happy that the sun will rise, happy to look in your eyes, and see that they are mine. I love you son, before you are. I love you son, however far, away. Just know my son, the sun will rise, with every dark cold night, there comes a day. 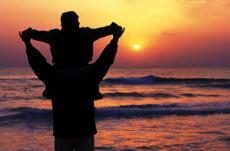 And my sun will rise, when you open your eyes, that first time, and see your dad, full of pride, full of love. Full of hope. © Copyright 2019 Ezekial Danger. All rights reserved. Wow. A very touching poem. You're extremely talented. Wow, i've never been called "extremely talented" im very honored, thank you very much. Ezekial this is tremendous. It comes straight from the heart, the soul and your spirit. All of you is in this and so is your truth. Your love and your promise. It is deeply touching and gentle. :-D thank you very much, it's exactly how i feel when i think of having a child, and when i look at my nieces and nephews.